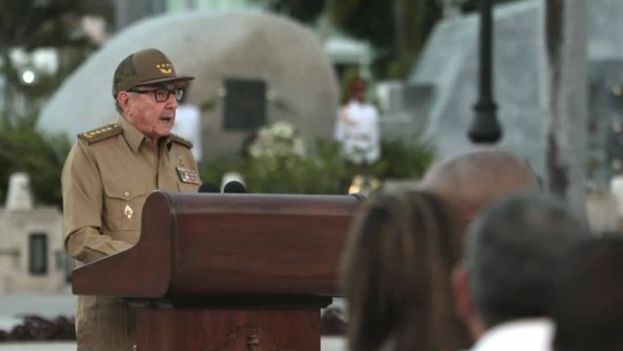 14ymedio, Yoani Sanchez, Havana | 9 January 2019 — As a gesture of profound symbolism, on January 1 the official ceremony to celebrate the 60th anniversary of the triumph of the Cuban Revolution was held in the cemetery of Santa Ifigenia in Santiago de Cuba. More than the birthday of a living thing, its defenders gathered around the cadaver of a process, the tomb of a utopia. The official slogans commemorated that six decades ago the “bearded ones” came down from the Sierra Maestra and burst onto the national life, but this doesn’t mean that the country has been in a process of renewal this entire time. It remains a task for academics to determine the date on which the original purposes were betrayed, but in day-to-day life it is easy to see that the Revolution has become a cadaver. Now, although the government insists on continuing to call the political, economic and social situation we have experienced the “Cuban Revolution,” any study of history can find notably differentiated periods in which the paradigms, purposes, and above all the timelines to fulfill the initial promise of a luminous future, have changed. The chronology of disappointment has more dates than the one that marks moments of satisfaction. Now it is almost obligatory to prepare an accounting that contrasts the achievements and failures, above all to respond to the question whether so many sacrifices, deaths, loss of rights, exoduses and imprisonments are equal to what has been achieved, or – at least – what has been proclaimed as accomplishments. Was it worth it to turn a nation upside down, tear apart its economy and redefine it, and push millions of the children of this land into exile? Throughout the first three decades, the expressly stated purpose of the process was to “build socialism” and specifically the system described in the manuals of the Soviet academy, from which it was not possible to deviate a millimeter under pain of incurring the grave the sin of revisionism. Those were the times of drawing the future in bright colors and demanding the absolute sacrifice of Cubans for the sake of that ideal. When the system collapsed in Eastern Europe, the Island’s authorities rushed to add the possessive pronoun “our” to socialism, and from that point any transgression of the dogma was allowed. They reworked the project to fit into the new historic context and, with this work of putting make-up on it, betrayed their most orthodox followers. That was when the Revolution died for those who hadn’t yet buried it during the exodus of the Mariel Boatlift in 1980, Fidel Castro’s support for the Soviet tanks in Prague in 1968, or the massive executions by firing squad of the first years. In the early nineties of the last century, and without an explanation based in Marxist theory, the religious of any denomination were invited to join the Communist Party; private businesses – which had been exterminated and demonized in the Revolutionary Offensive of 1968 – were permitted; and to top off the heresies, since there was no longer the “pipeline” of subsides coming from the Soviet Union, it was considered necessary and profitable to accept and promote foreign investments, obviously from capitalist countries. The precepts of the trashy “egalitarianism” that had molded the social reality during the first steps of the process ran up against the reality of the rise of the new rich and the fact that the State could not guarantee a rationed market that could cover people’s needs, nor a system of material privileges to win loyalty. Money resumed its value as a medium of exchange, and to the extent that foreign tourism arrived on the island the dollar delineated the new face of daily life on the Island. With enthusiasm exhausted and the illusion that the revolutionary process could offer a dignified life to every Cuban extinguished, only repression remained to maintain control. The conquests in public services, such as education and healthcare, also suffered a frank deterioration and today languish under the problems of infrastructure, excessive ideologicalization and large ethical gaps. Nor is the original leader alive. The years of the permanent call to action and the perennial mobilization imposed by Fidel Castro have been left behind. His brother, Raul Castro, tried to impose pragmatism during his mandate, but barely managed to unlock some legal absurdities, for example allowing Cubans to travel, or to buy and sell their homes and cars. His successor, Miguel Diaz-Canel, can’t get past the discourse of continuity, even though he dresses in shirt sleeves and appears, for the first time in more than half a century, accompanied by a first lady. Hence, the 60th anniversary is celebrated at a crucial moment. A dozen octogenarians, survivors of purges, heart attacks and accidents, self-proclaimed as the historical generation of the Revolution, begin to prepare their withdrawal and accept the inescapable reality that they need a relief player. The new wolves in the litter show their hands free of the blood and confiscations, as they swear allegiance and promise to sustain continuity at any price. At the moment, the most notorious and transcendent fact that leaves its mark on the sixtieth birthday is the new Constitution of the Republic. A list of articles that seeks to leave the system “well secured” against potential heirs who might want to dare to change something. It is the road map of immobility, the rigid and unappealable political testament of a process that once boasted of renovation and irreverence. In its articles are enshrined the “irrevocability of socialism” and the role of the Communist Party as society’s maximum leading force, a clear example of the conservative will – a negation of the revolutionary spirit– that has dominated the regime for a long time. It is the last gesture to try to control from the tomb of the Cuban Revolution the life that continues to flow out here. A corpse that seeks to regulate each step, each breath, as if the coffin of history could condition the future. This article was originally published in the Spanish newspaper El País.